The Task-Based Asynchronous Pattern provides a simple and easy way to improve the performance and scalability of MVC 4 web applications. Every web application has a finite number of threads available to handle requests, each of which has a certain degree of memory overhead. Asynchronous methods take the same amount of time to run as synchronous methods, however asynchronous release their executing thread, allowing more simultaneous requests to be processed. Asynchronous methods are not appropriate for every situation. Synchronous methods are more appropriate for short simple operations, and operations that are CPU intensive. Asynchronous methods are appropriate however in situations that parallel processing is possible, situations that rely on network requests, or any long running requests that are holding up the site performance. Additionally, any process that you want to be able to cancel before completion should be asynchronous. 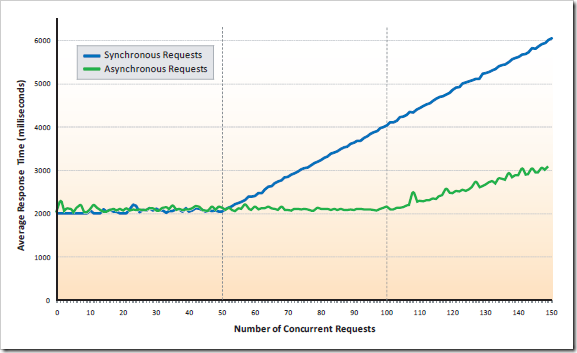 Figure 1 shows the results of a test where the IIS thread limit was set to 50 and the number of concurrent requests increased over time. This figure makes clear the advantage of asynchronous methods over of synchronous ones in situations with a high volume of concurrent requests. Task<TResult> is a class in the System.Threading.Tasks namespace, and provides a hook to notify any listener that work has been completed. The async keyword indicates to the compiler that the function is asynchronous, and is meant to be paired with a corresponding await keyword. Without using await, the method will be executed synchronously. await releases the controlling thread back into the thread pool, and that execution will continue when the corresponding task finishes. In this case, GizmosAsync() will run on an IIS thread, same as Gizmos() until it executes “await gizmoService.GetGizmosAsync()”, then the IIS thread will be released back to the thread pool until GetGizmosAsync indicates that it is ready, at which point an IIS thread will pick up the execution and finish the method. Use of Asynchronous methods also allows the performance enhancements offered by parallel processing. Figure 3 shows a synchronous and asynchronous method for getting three lists of objects. The synchronous method must execute each request sequentially before returning a value; the asynchronous method requests all three requests simultaneously and so can return a value as soon as the last Task completes. A final feature of asynchronous methods is their ability to be cancelled before completion. This allows users to cancel long-running tasks without having to take an action such as leaving or refreshing the page. Additionally, it provides for the automatic time-out of potentially long-running functions, throwing the designated error. As these examples show, asynchronous Controllers in MVC provide for improved scalability and performance over the use of just synchronous methods. Asynchronous Controllers and methods can and should be utilized in any MVC web application that needs faster performance during long running processes or will handle high-volume requests. A useful feature in HTML5 is native browser support for drag and drop (DnD). HMTL5 drag and drop supports the designation of any element as draggable, as well as setting any element as a drop target, specifying the behavior for each step along the way. Additionally, drag and drop across browser windows and even to and from the desktop is supported. Drag and Drop is natively supported by all major browsers, and partially supported as far back as IE5. By default, only images and hyperlinks are draggable. To allow other elements to be dragged, simply declare an attribute draggable and set to true. This will allow the user to drag the element and causes the drag events (dragStart, dragEnd, and drag) and drop events (dragEnter, dragOver, dragLeave, and drop) to fire. Elements can be set to copy their content, move completely, or simply link back to the source element. An important note is that elements are not eligible drop targets by default, and so the default behavior of the dragOver and dragEnter events must be cancelled to allow dropping. A simple example of HTML5 drag and drop is given in Figure 1.
e.preventDefault(); // stops the browser from redirecting off to the text.
" + e.dataTransfer.getData("Text") + "
Figure 1 Simple example of drag and drop. Some critics call the system cumbersome because of the number of event and event handlers involved, especially since the API is based on an older IE5 implementation. However, native cross browser support of drag and drop without relying on external libraries is a useful feature that developers should be aware of, especially with the inclusion of support for file drag and drop to and from the desktop. HTML5 is the new web standard and features of it are increasingly being supported by all the major browsers. A key feature of HTML5 is the ability to store data on the client. This allows a website or app to be used offline and upload information when a connection is next available, for user preference data to remain client-side, as well to reduce bandwidth required to use the site by implementing client-side caching. This Web Storage feature is available across all modern browsers, including IE 8+. Figure 1 Simple examples of using HTML5 Web Storage objects. Figure 1 gives some examples of the manipulations you can make on the data in the Web Storage objects. An important thing to remember is that only string values can be stored, so more complex objects can be stored using the JSON.stringify() function and retrieved using the JSON.parse() function. Additionally, event listeners can be attached to the storage objects allowing multiple windows using the localStorage object to stay in sync and prevent race conditions. localStorage is a good solution replacing cooking, retaining data such as user preferences that remain client-side, keeping data past a page refresh, and allowing apps to be used offline. sessionStorage is a good solution for things such as shopping carts, or sensitive data that should be disposed of after the session is complete. With the widespread adoption across all browsers and a simple API, Web Storage is a valuable tool to be used in web site or app development. This is the second part of a two part series describing how to connect to an Exchange Server, monitor for new mail, and locally download attachments. The previous post described how to connect to the server and create a subscription detailing what notifications you wanted to receive from the server. This post will continue on with actually requesting those notifications. So every poll tick, we want to get any new notifications. The GetSubscriptionItems() function gets any new event notifications, loops through them and retrieves the actual mail message, then if it has attachments, retrieves the attachments. // the Status even is sent periodically as a heart beat signal). // In this example, we are only interested in ObjectChanged events, so we'll ignore any other event type. The GetEvents() function of course is the initial request to the Exchange service to get any new updates. In it you first create a GetEventsType object, similarly to all the other requests. Then you assign it the most recent watermark and the subscriptionId – the watermark updates with every request. Then after checking for errors, you use the GetEventsResponseType property Notifications.Items array as the return value with any actual notifications. ///<summary> /// Gets the latest events for a specific subscription. /// Subscription for whic to get the latest events. /// Array of notification events. // Extract the first response message that contains the information we need. // Update the watermark of the subscription info. // time GetEvents is called. // Retrun the array of events. Back in GetSubscriptionItems, each notification is checked to ensure it is the correct type and the corresponding actual email is retrieved from the server, via the GetItem function. An ItemType actual encompasses emails, calendar items, tasks, and contacts. In this case we’re only interested in MessageType objects, so the results of this get cast later. You’ll also notice that I’m adding an AdditionalProperty to the BaseShape. By adding the itemMimeContent to the BaseShape, the retrieved item will be able to be serialized to an .eml file and saved locally as a backup. .msg files cannot be saved. The rest of the code follows the fairly standard Exchange service procedure – make a GetX object, set the properties, get a GetXReponse from the function call on the ServiceBinding, check for errors, then return the result. /// Retrieves the details of an item on the server. ///Id of the item to retrieve the details of. /// ItemType object containing the details of the item. // Set the response shape so it includes all of the item's properties. // Call the GetItem EWS method, passing it the request that we just set up. // Fail if that response message indicates an error. // Finally, return the item detail. After getting the actual email message, then any attachments to that email are retrieved. This is done by creating a GetAttachmentType object and setting IncludeMimeContent to true on the AttachmentResponseShapeType. Then you set the array of RequestAttachentIdType to the AttachmentIds property of the GetAttachmentType object, and make the actual request to the ServiceBinding object. Cycle through the results and verify that each does indeed have a file attachment and that it is the desired type (pdf in my case), then save each pdf to disk. Voila! You’ve successfully retrieved and downloaded pdf attachments from all incoming email that you’ve subscribed to. Hopefully these two posts have been useful to you if you’re trying to set up a connection to and Exchange server and still back on 2007. I did skim over a few area – GetFolderByPath comes to mind – and I plan on addressing that in a later post. I was recently asked to create a windows service to interface with the client’s Exchange Server 2007. As I had never done that, I did some research and came across the Exchange Web Services. Basically, Exchange servers 2007 and later expose several web services to enable 3rd party tie-ins to the data. In my case, the client wanted all pdf’s in a certain folder to be downloaded along with the original email as they arrived. In order to use the Exchange Web Services, you must create a Web Reference that points to your Exchange Server. Right click on your project and select Add Service Reference from the context menu. Now, since I’m working with 2007, I have to do a few extra steps to make it work correctly – just adding a regular service reference does not work. To connect to the Exchange Service, you create an instance of the ExchangeServiceBinding class, providing it with the URL and login credentials for the Exchange Server. After setting up the ServiceBinding object, in this case I wanted to create a subscription so that I could get updates as messages came in to the Exchange server. There are two types of subscriptions – push and pull. A push subscription requires an additional service to be running that the Exchange server can call as subscribed events occur. As my application did not require live updates, I went with a pull subscription. Using a pull subscription, you periodically request any new subscribed to events that have occurred on the server. The events are specified when setting up the subscription. The folders you are paying attention to are also specified during this time. // And on which folder to subscribe for these events. Next, we will actually make the Subscribe request on the ServiceBinding object created previously, then check to make sure it succeeded. As this post is already getting a bit long, I’m going to break it up over a few posts. Hopefully this contained some information that helped you understand how to connection to an Exchange Web Server. The next post will cover getting notifications from the ServiceBinding.